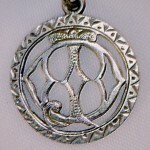 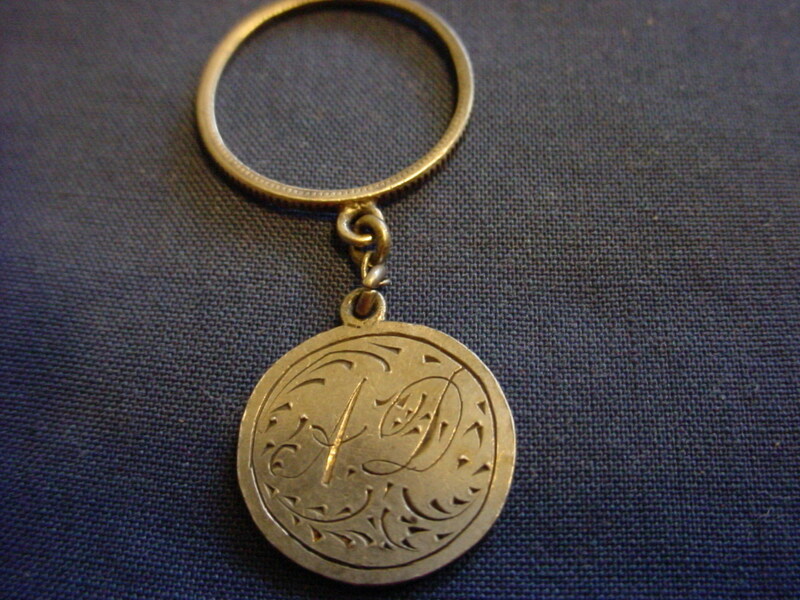 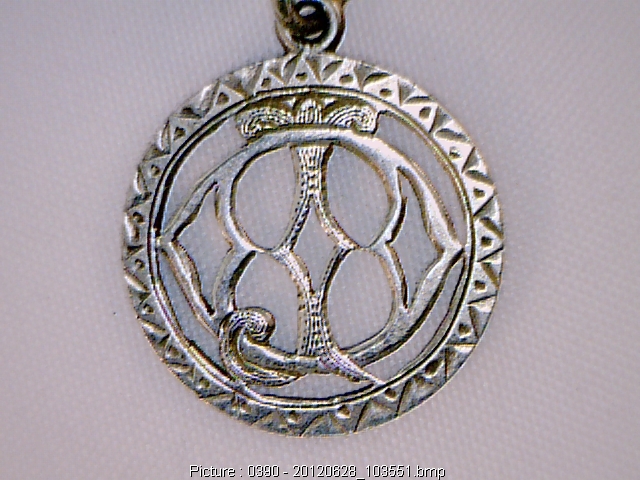 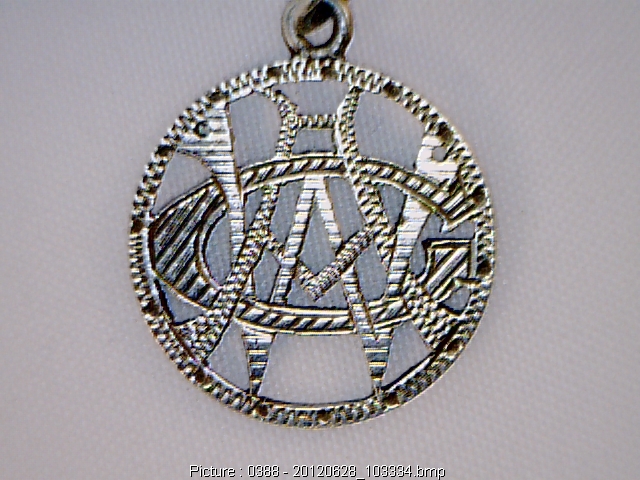 Below are images of unusual love token jewelry. 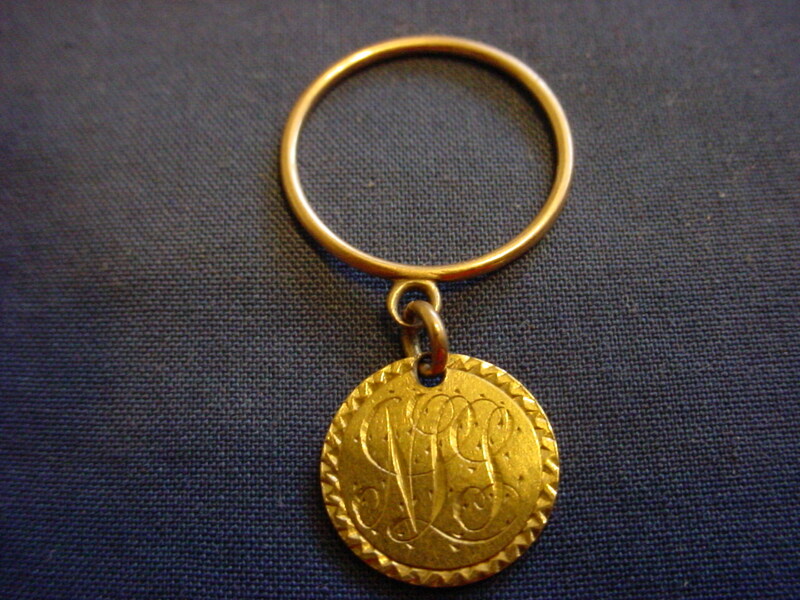 Top row: Gold love token bracelet obverse and reverse. 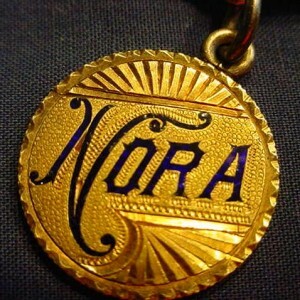 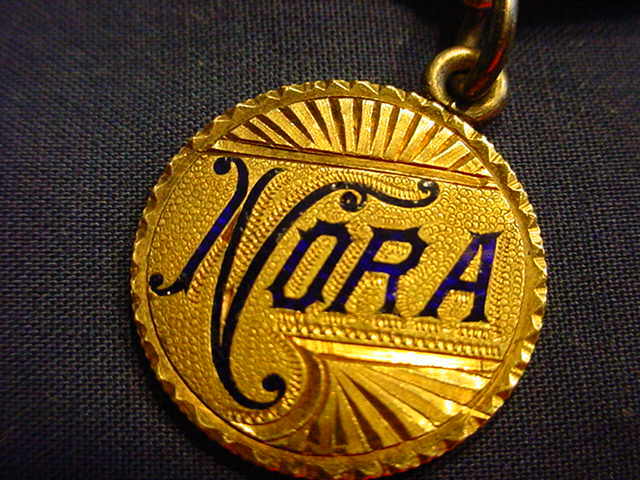 Above left: Nora in blue enamel with ornate engraving on $2.50 gold. 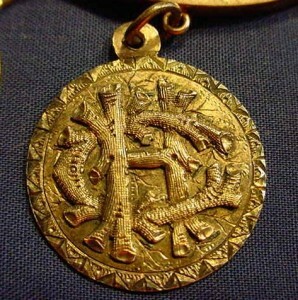 Above right: CH in gold overlay resembling logs or branches. 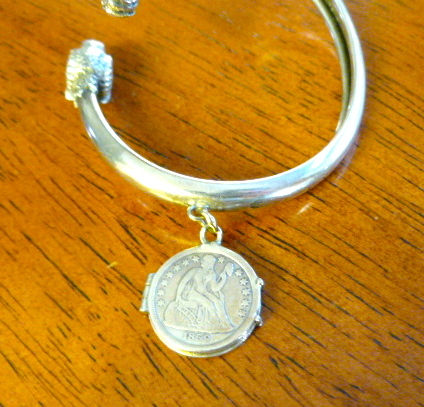 Below: Hinged bangle silver bracelet with mix of cut out initials. 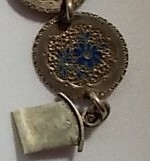 Half dimes with “Annie 1891″ and flower in blue enamel. 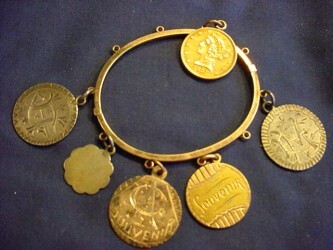 Above: Victorian charms and German love tokens, some with very interesting sayings that had to be translated from German. 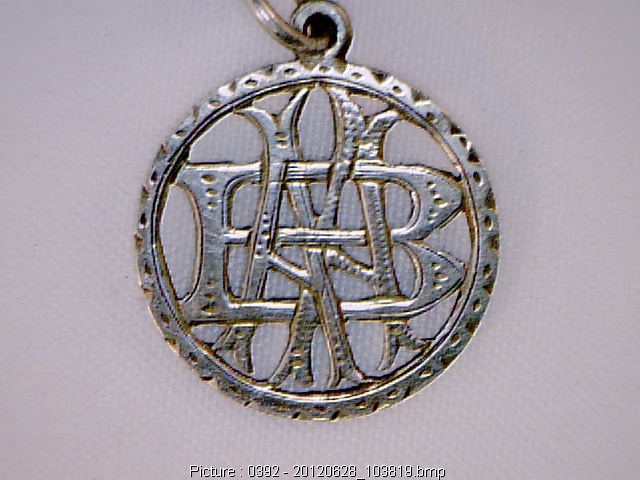 If you are always happy then you become a beggar (“Jinnerheiter Bettleweiter”). 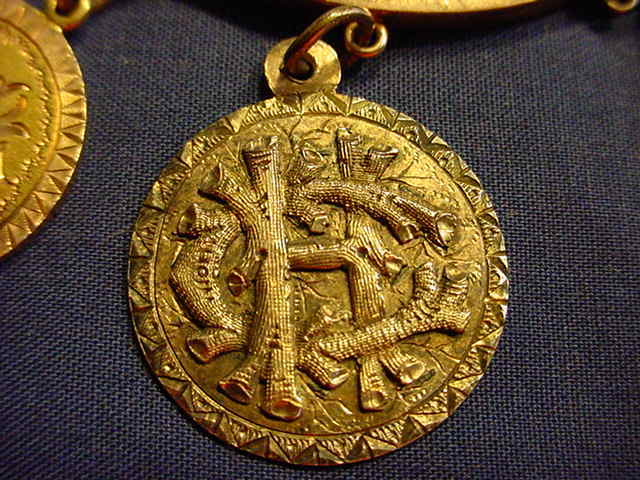 Everyone for a joke and one for the heart (“Alle zum scherz eihen furs herz”). 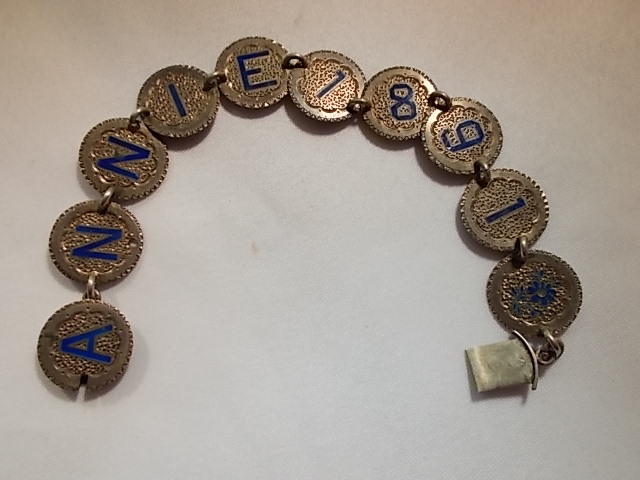 From one tea sister to the other (“Der jungsten theeschwester zernandenken”). 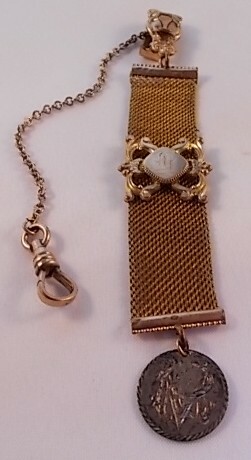 Band style bracelet with some nice pictorials, jeweled pictorial (flower basket), and enamel. 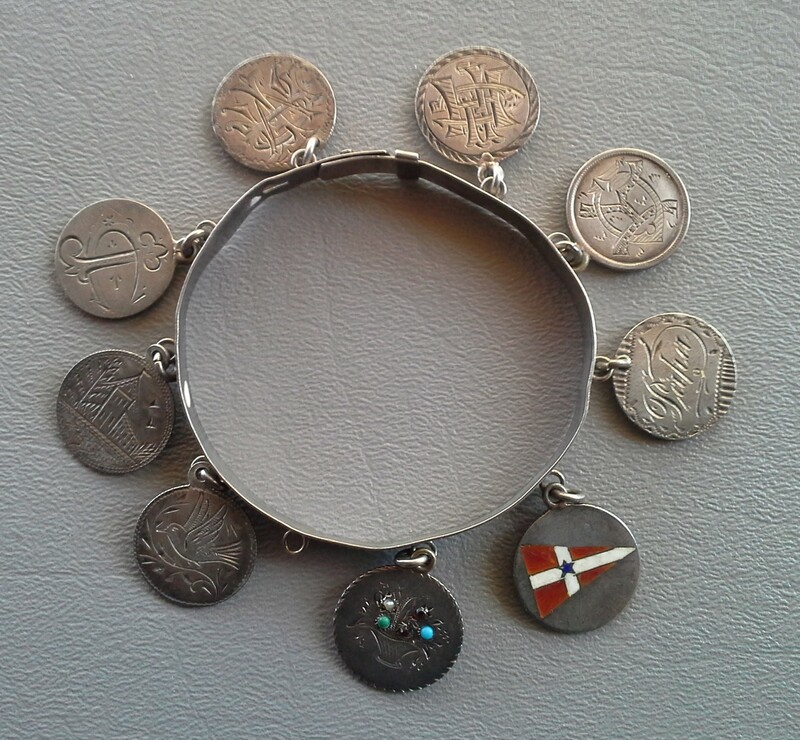 Belonged to the submitter’s Norwegian grandmother who was born in 1889 and emigrated to the US in 1919. 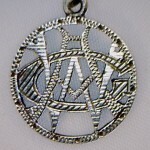 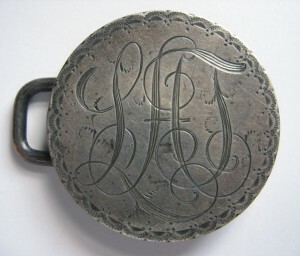 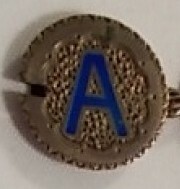 Engraved LAT in later monogram style. 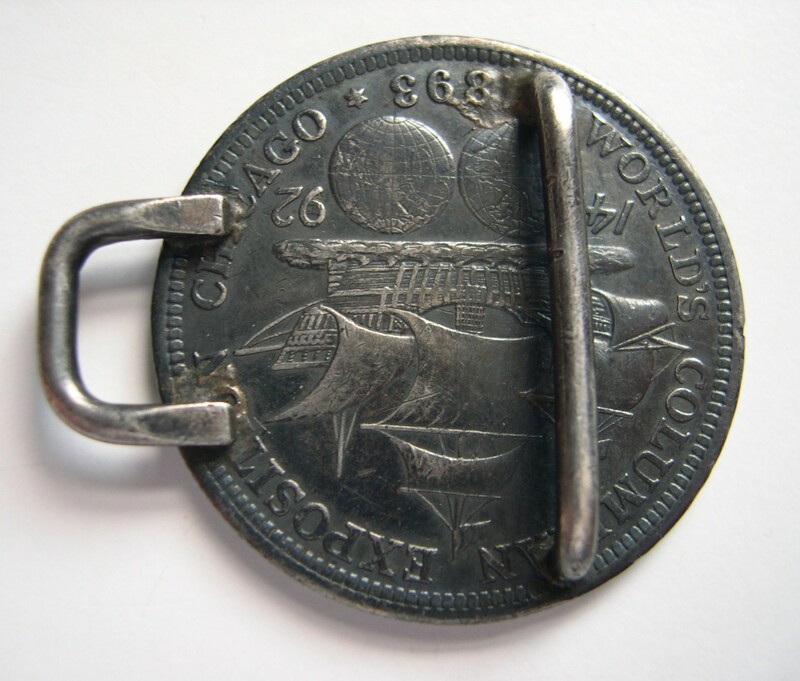 Columbian half dollar belt buckle. 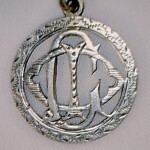 monogram. 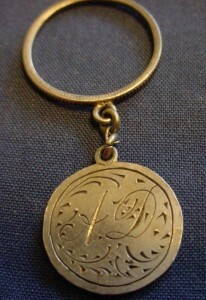 Egyptian motif on fob plaques. 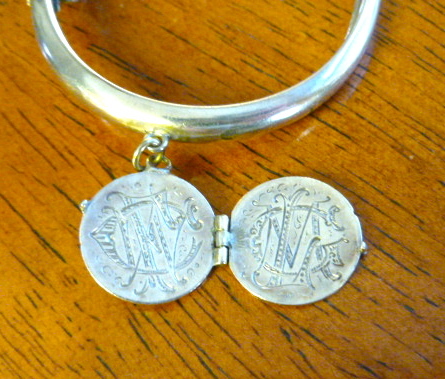 Sterling cuff bracelet with rams heads at ends. 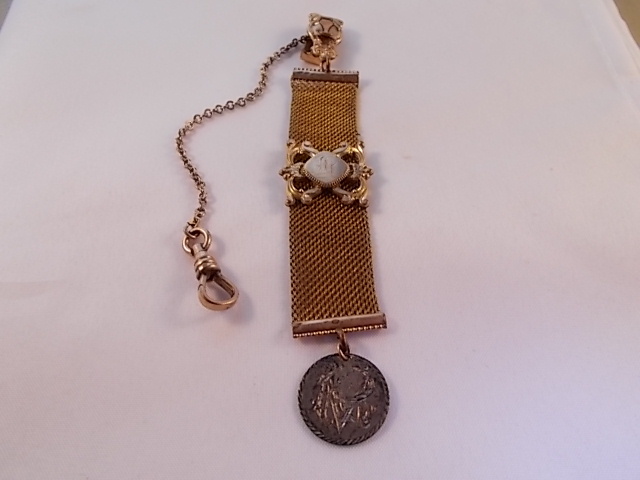 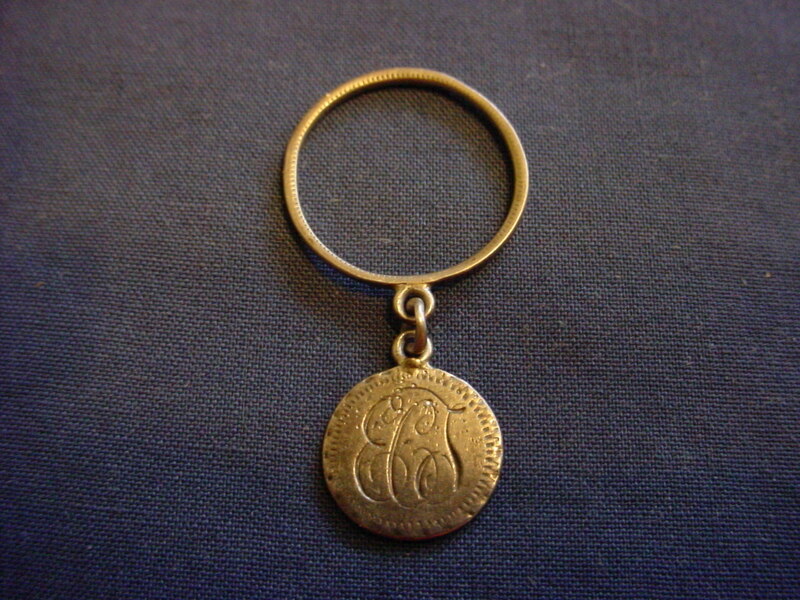 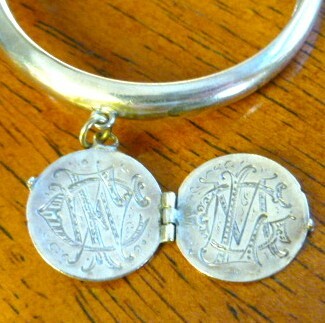 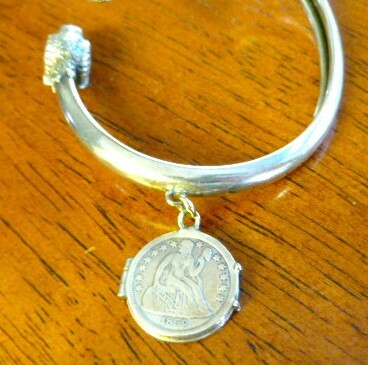 Highly unusual love token locket suspended from bracelet. Coin date: 1859. 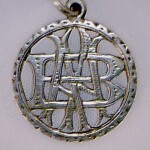 Initials of the submitter’s great grandpa and grandma (Note: maiden initials). 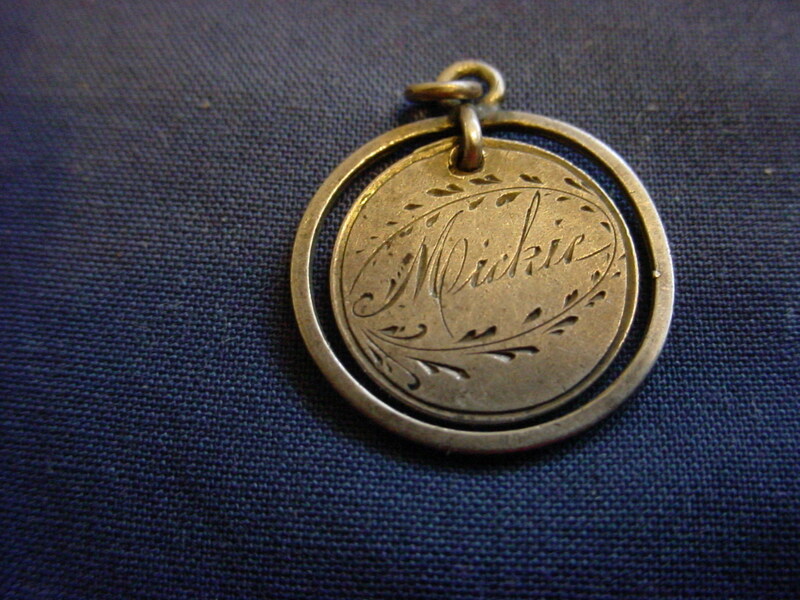 The 1859 coin date marks the birth year of both great grandparents. 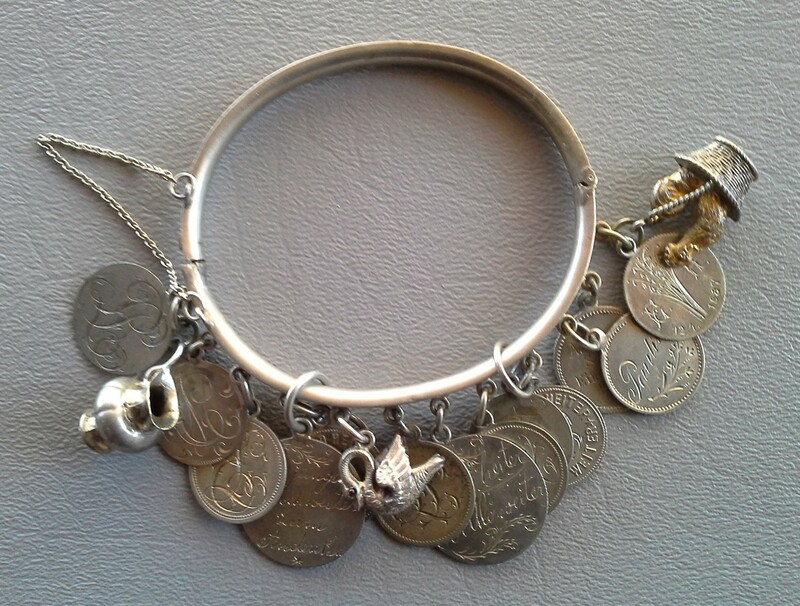 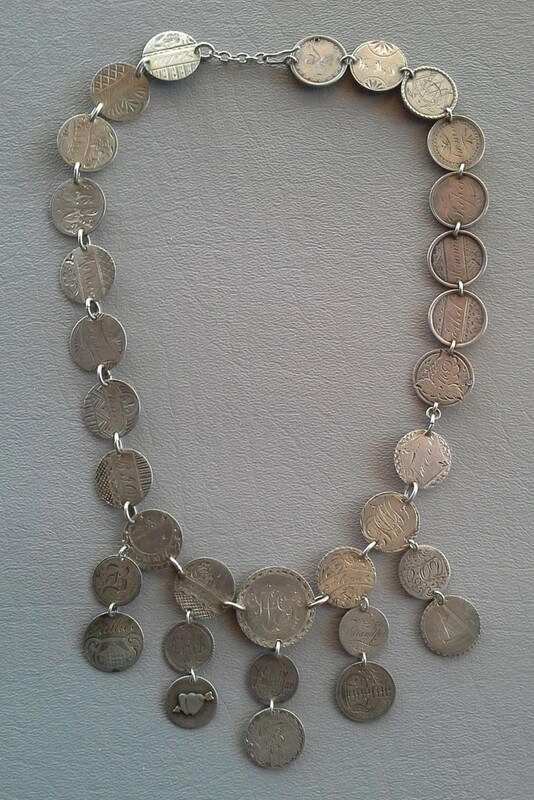 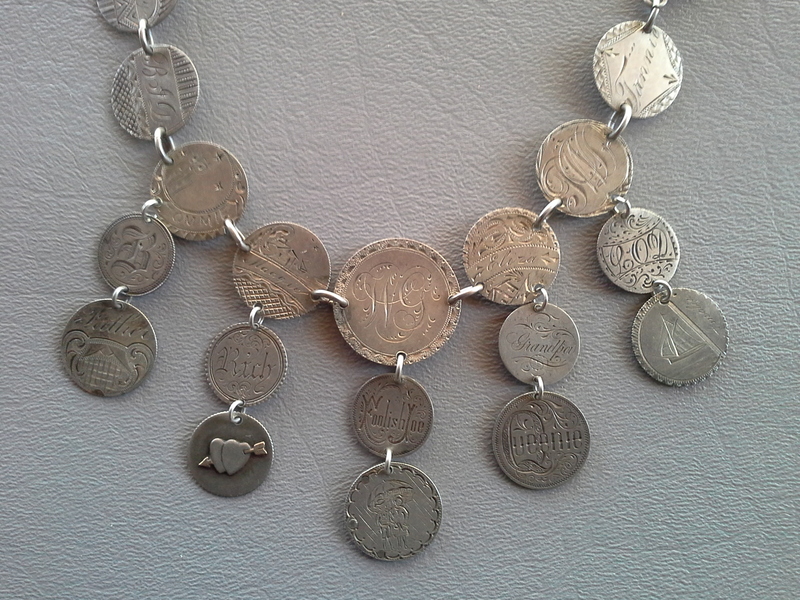 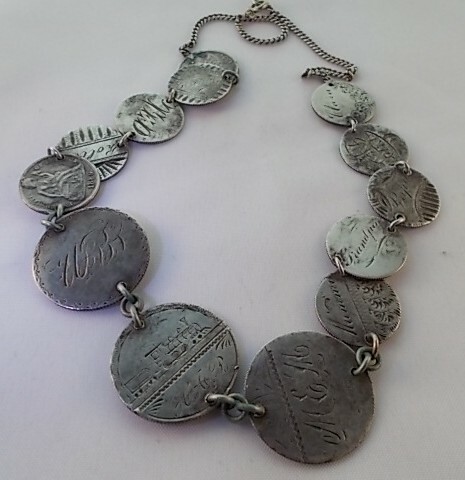 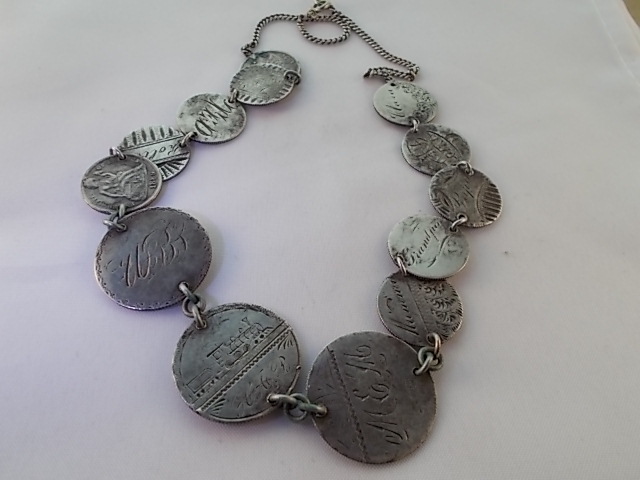 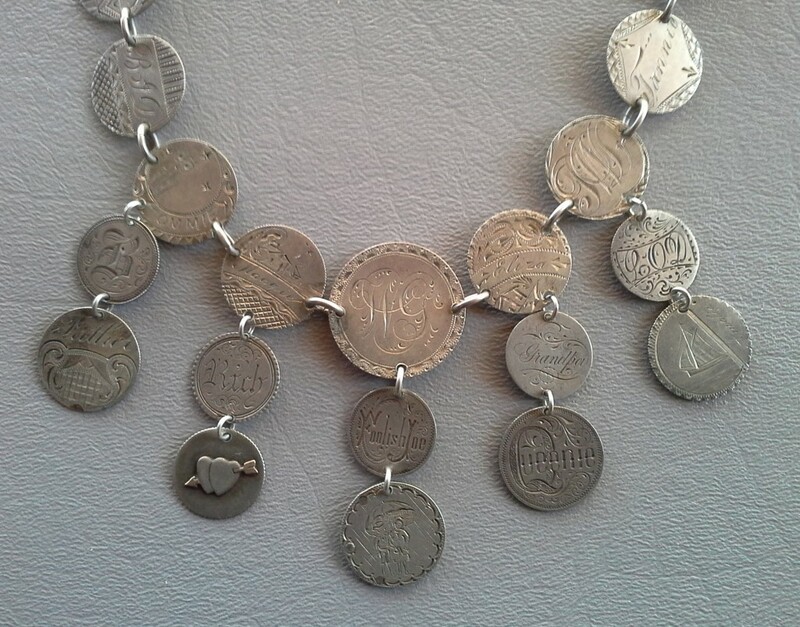 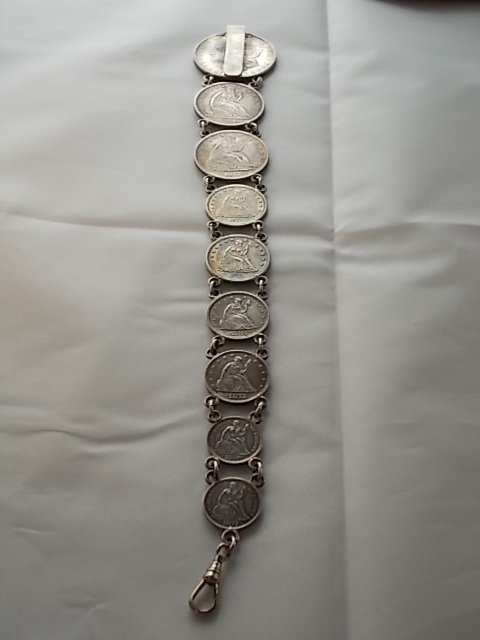 Necklace made from Liberty seated dimes and half dimes, one Barber dime, one Canadian five cent, and one Canadian twenty-five cent. 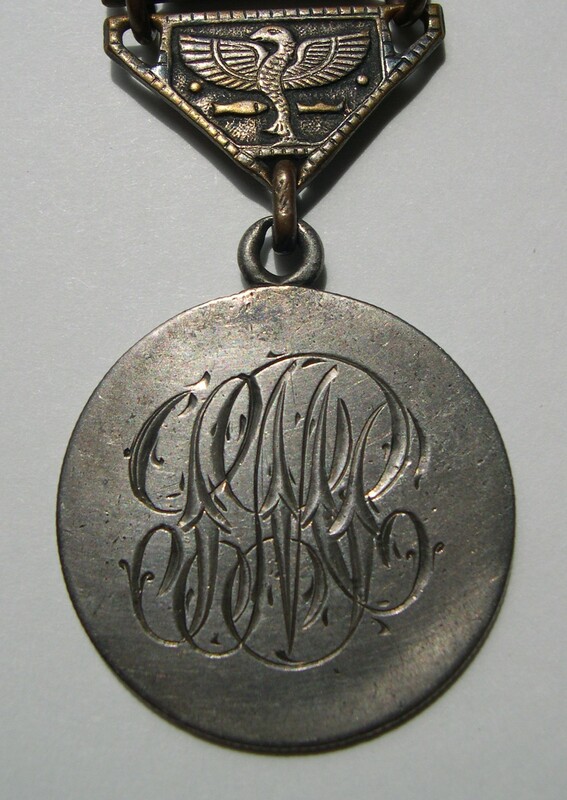 On the detail below, note the gold and silver heart overlay and the unusual couple under an umbrella. 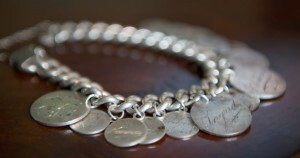 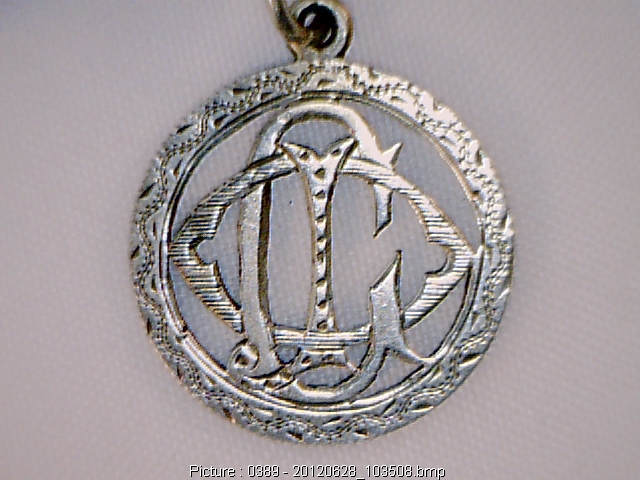 The necklace contains various pictorials, family members, names, initials, and one “Foolish Joe”. 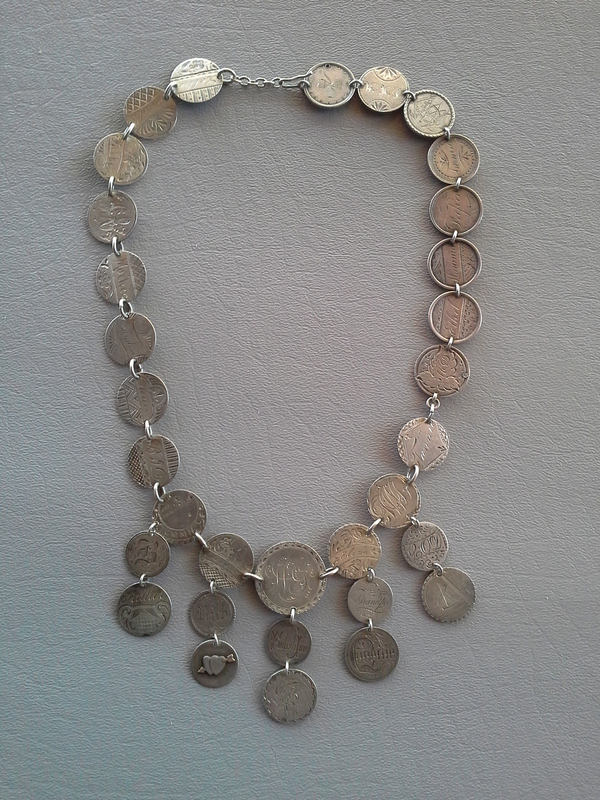 Examining the construction, it appears that this necklace may have been put together from three separate bracelets. 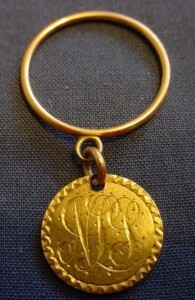 It is not unusual for jewelry to be remade during the period, as more love tokens were acquired by an individual. 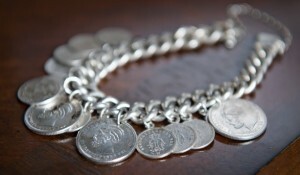 Plugged top holes can also be found on bracelets. 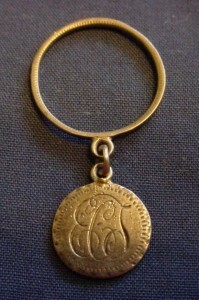 Charms could have been acquired and then when there were enough, they were made into a bracelet with side hole or link construction. 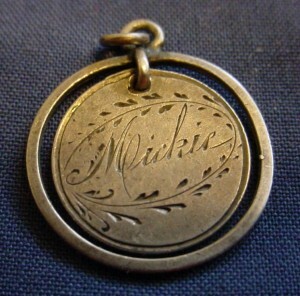 Note the train pictorial on this love token necklace.